Welcome to the fourth post in our series on “Game of Thrones” fashion. If you haven’t read them already, be sure to check out our previous articles on fashion inspired by House Stark, House Lannister and House Targaryen. House Baratheon is the current ruling house of Westeros, so you’d think their lives would be relatively drama-free, right? Wrong. So wrong. I won’t spoil anything for you new viewers, but the Baratheons’ grip on the Iron Throne isn’t exactly as strong as they thought, which is why three factions are soon brawling over which Baratheon is the true king. House Baratheon is a rather earthy, traditional house – their stag sigil and signature golden-yellow colors evoke a strong, yet graceful presence that seems destined for leadership. 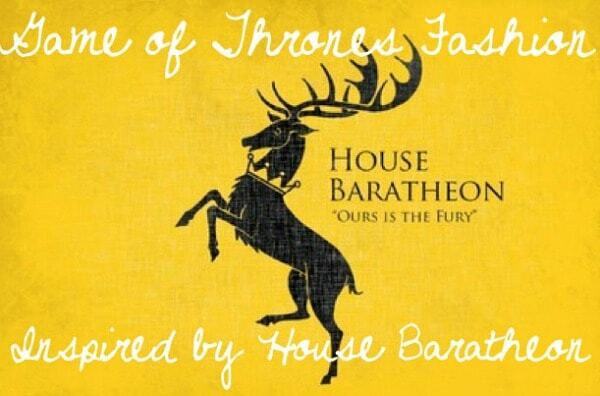 Baratheons are skilled hunters and warriors, and they can also exude charisma and great social prowess. For a modern update on the Baratheons’ traditional hunting garb, pair a graphic sweater (featuring a stag, of course) with a pair of bright yellow tailored shorts. Okay, so the pop of color wouldn’t help you on an actual hunting trip, but you get the idea. Next, add an embroidered brown belt for an earthy feel, and slip on some sturdy tan brogues. Complete the look with delicate but fearsome jewelry, like an arrow-shaped bangle and matching earrings. Stannis Baratheon is the relatively level-headed, collected Baratheon brother – that is, until he cozies up to a fire priestess. Under Melisandre’s influence, Stannis becomes an even more fearsome warrior. For a priestess of the light, she uses some questionably dark magic to help Stannis ascend to the throne. 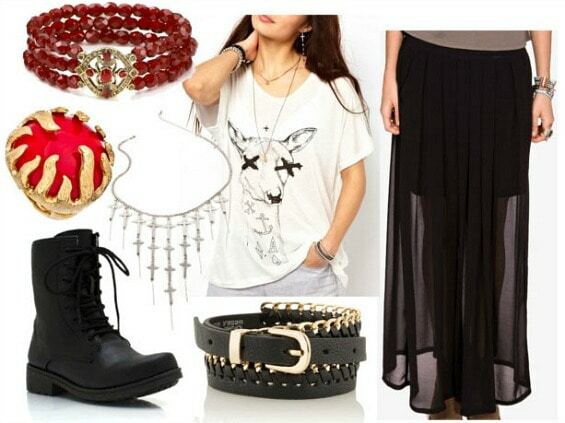 If you’re in the mood for a darker look, pair an edgy graphic tee with a semi-sheer black maxi skirt for a wicked spin on House Baratheon’s usual look. Add details like a chained belt and a multi-layer cross necklace for a modern-punk twist. Of course, no look of Melisandre’s would be complete without plenty of red, so add a deep garnet statement bracelet and bright cocktail ring to finish the look. Out of all the potential Baratheon kings, Renly is by far my favorite. His greatest strength is the one thing both Robert and Stannis lack – the ability to really lead. He’s not a great warrior or strategist, but his natural charm draws people in anyway, helping him forge an alliance with the wealthy House Tyrell. 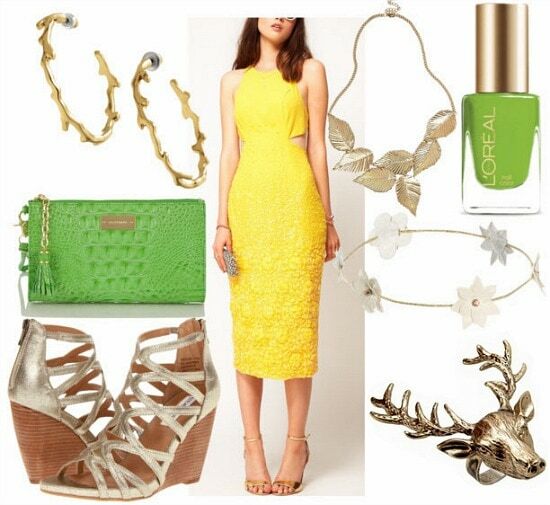 Exude Renly’s kingly grace with a bright yellow midi-length dress. Royal details like subtle cutouts and floral texturing make this the perfect dress for an aspiring ruler. Of course, it’s important to add signature Baratheon elements to the look – a stag ring and branch-shaped hoop earrings should do nicely – but Renly’s look is heavily influenced by the Tyrells’ ethereal approach to fashion. Add elements of green to your look – like a jade clutch and matching nail polish – to symbolize this important alliance. Next, try accessories inspired by nature, like a gold leaf statement necklace. Of course, no king is ready to rule without his crown, so add a faux flower garland circlet to complete the look. What are your predictions for the rest of season three? (No cheating, book fans – and please avoid major spoilers in the comments!) What do you think of the outfits? Be sure to leave me a comment and let me know what you think – I love hearing your thoughts!